The Reynolds boys basketball team returns a handful of players, while bringing in a young mix of players of the bench. "We can't start running before we walk. We need to go back to fundamentals and work on building up that basketball I.Q.," Raiders coach Ted Aubin said. Senior Eric Martinez directs the team at the point guard spot, while Kehdon Fletcher brings his all-league football ability to the basketball court. "Eric is able to withstand pressure and bring the ball up the floor," Aubin said. "Kehdon does a little bit of everything — he's an athlete and our best competitor." Senior Cam Mager gives the Raiders an ability to score in flurries from long-range, routinely hitting 30 out of 40 shots in practice drills to earn the green light on game nights. "He's more of a catch-and-shoot player, but he's finding ways to give himself other scoring opportunities," Aubin said. "He's a guy who has squeezed every bit of talent out of his makeup — he's a really good shooter and he plays smart." Senior Sterling Bell is the tallest player listed on the roster at 6-foot-3 and will fill the team's post spot. The Raiders went 2-9 through the preseason, winning their season opener along with their final nonleague matchup last week. Reynolds held six of their opponents under 60 points. "We're capable to being a pretty good defensive team," Aubin said. The trouble has come on the offensive end of the court where the team has been held in the 20s three times. "We've shown that we can shoot it in practice, but we've struggled to shoot in games. We've had trouble finishing at the rim," Aubin said. "We need to find a way to get those easy buckets and stretch the defense." The Reynolds girls have a coaching change this season, bringing in Kelsey Stone, who assisted with the team the past few years. She discovered coaching while still a student at Centennial High (class of 2005) when she took on fourth-grade YMCA teams. "I love working with teens and teaching these kids about more than just sports," Stone said. She works as a corrections deputy at the Multnomah County Jail. Leading this year's charge is guard Kayley King, who has shown herself to be the team's most aggressive player. "She's going to be our go-to player when it comes to scoring," Stone said. "She can score from anywhere on the floor, and she's not afraid to mix it up against bigger players." Also in the backcourt is senior Christina Chernoff, another scorer who can beat you with the long ball or off the dribble. "She has no fear. She will go full boar right at you, and she can shoot," Stone said. Sophomore Olivia Lambert holds down the post position, relying on her jumping ability in the front row from volleyball. "You watch her block shots and it is clear why she plays volleyball," Stone said. "And there aren't many posts who get down the floor as quickly as she does." The team's most improved player is junior forward Brisa Avalos, who was part of the jayvee II squad last year. She is expected to be a force on the boards. "She played every day possible over the summer to get better and she has," Stone said. 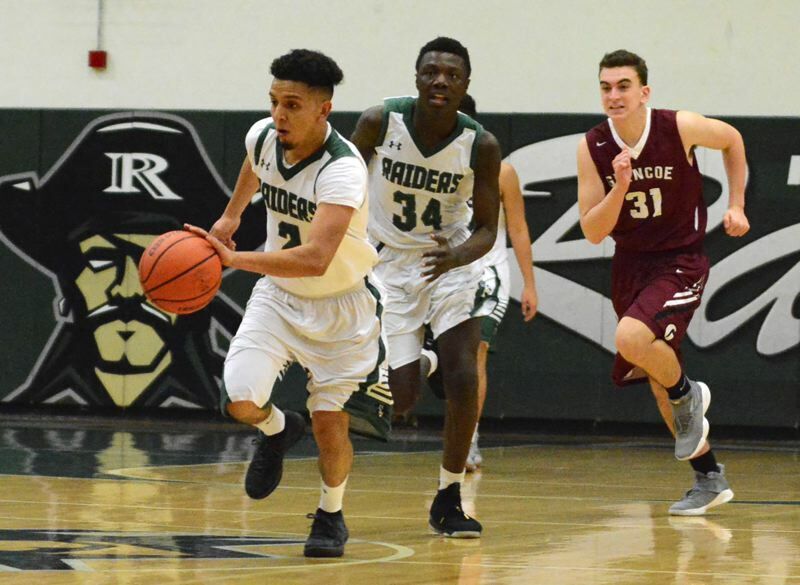 An early-season 65-61 overtime win over Sunset marked the Raiders first win in almost a full calendar year. Reynolds was down two with half-a-minute to play when King took an inbounds pass near the sideline and hit a step-back 3-pointer for the lead. Sunset missed a free throw at the other end, Avalos pulled down the rebound and hit two foul shots at the other end to seal the victory. "They are a bunch of fighters," Stone said. "They went 1-23 last year, and I think they got comfortable losing. I think that win over Sunset put some fire in them." Despite a 2-8 preseason mark, the Raiders have held halftime leads in half of their games, Stone said.